Well, okay maybe I am over reacting. But I am faulting myself for so many things as of late. One being after such a good start and track record, I had chosen to kinda sorta over work myself last week and not even think about my blog or the DOC community, other than to harass one friend about Florida, order some cherry Blunt Lancet merch. for Florida, and try to wish someone a happy birthday. I read no blogs, I did absolutely nothing. Why?? I don't know. I mean I did have some free time, but I guess I just chose to slack. Which is never good for me, once I do start to slack things pile up. 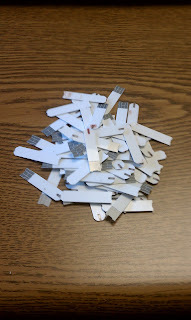 Take for instance the fact that I can't even remember how long it has been since I have taken my test kit near a trash can to empty out my ever growing pile of test strips. I brought it out today to make a special appearance, just to show you how off I have been. Usually I go every few days. I know I am bordering on at least two weeks now. In case you are curious, there are 93 used test strips there. The 93rd is on the top of the pile, freshly used for a BS of 135, post lunch. I am down with that. Granted my CGM is currently at 99. (New CGM though). That number though amazes me. And I can tell you along the way in my travels I have lost some strips. 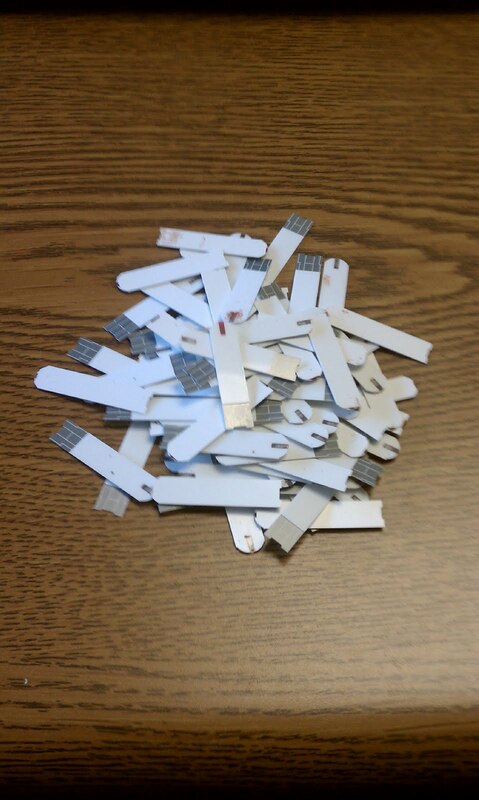 So basically at any given time counting used and unused I had about 130 or so test strips in my kit. Key word being had. I just tossed them all. 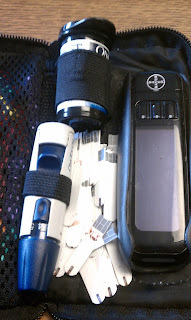 If you look at the test kit, I know I have said this before somewhere either here on this blog or elsewhere. I do use the Contour USB for my blood sugar tests. I did not like the bag it came in though. It was a little bulky and I could not store my emergency insulin in it because the outside pouch velcroed horizontally and not vertically meaning I had a much better chance of everything falling all over the place.... Oh wait, that has happened. So I took the case from the One Touch Mini and moved in, but I also had to keep an old One Touch strip container, since the other one did not fit in all that well. (I really need to find a better way of organizing myself and my meter). So yeah I slacked on that and a blogging. Also, exercise. I can't even really figure out the last time I went for a run. I mean, i have been playing basketball once a week with my Youth Group and have joined a summer Ultimate Frisbee league. But I also know that I am not exercising to keep off what I eat.... So I need to work on that as well. Life gets busy, things get in the way sometimes, but I am still disappointed. I have been waging this battle with my body for years and in the course of 6 months, between ankle injuries, bad weather, and pure laziness all of my hard work is shot to hell. I have 2 months to my doctor visit. And I want to at least be near the weight I had last visit... AAAAAHHHH. These may not be super epic faults, but today I feel they are. My sugars have been decent, but they would be better has I maintained my exercise, I have fallen into the trap of grazing more so than I used to. All things I can fix, but when I don't, when I fail. I am truly sad. I need to work on this. If you have any advice please pass it on. I know I can do this, but it just kills me how badly I slipped. But as I tell people all the time. Just because today sucked, doesn't mean I have to repeat the same mistakes again tomorrow. Peace, Love, and Unicorns to you all!! !